I am constantly impressed with Rylin’s quick responses to life’s little conundrums. For three years old her insight is impeccable though sometimes a tad sassy. When we entered the playgroup with our local school district, the teacher greeted the girls. When Grandaddy and Aunt Carol were babysitting, Grandaddy was going to the grocery store. Harper begged to go too. 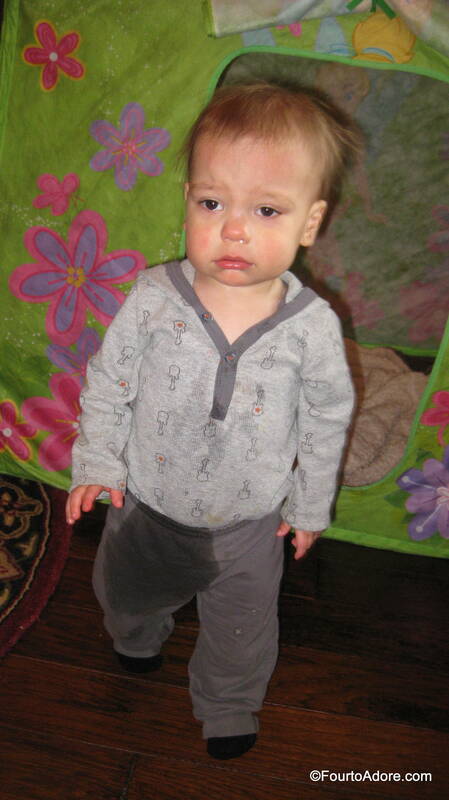 At birthday party another child spilled a cup full of water, which spread all over the table. Psst…If you enjoy keeping up with Four to Adore, check our pages on Facebook, Twitter, and Pinterest for the latest. During the holiday season we took the kids to Starbucks for a hot cocoa date and ordered a peppermint mocha for the adults. When Sydney batted her big brown eyes and begged for a sip, Daddy obliged. Her thoughts on the beverage…. A toothpaste flavored beverage doesn’t sound particularly enjoyable to me, but Sydney seemed to enjoy it, and I thought it was a good peppermint mocha. What will these kids say next?!?! The kids have been rather gregarious for a while now, but in recent days they’ve been coming up with some hysterical and sometimes heartwarming material. In fact, I purchased a blank journal for each of them and have done my best to jot down our favorite quotes. If you follow us on Facebook, you may have seen a few cute ones posted. This gem comes from Harper. Harper and the happy new family! Pssst….If you enjoy keeping up with Four to Adore, don’t forget to subscribe to this blog and have the latest posts delivered directly to your inbox. It’s been quite a while since an episode of Shawver Shenanigans. It’s not for lack of Shenanigans. 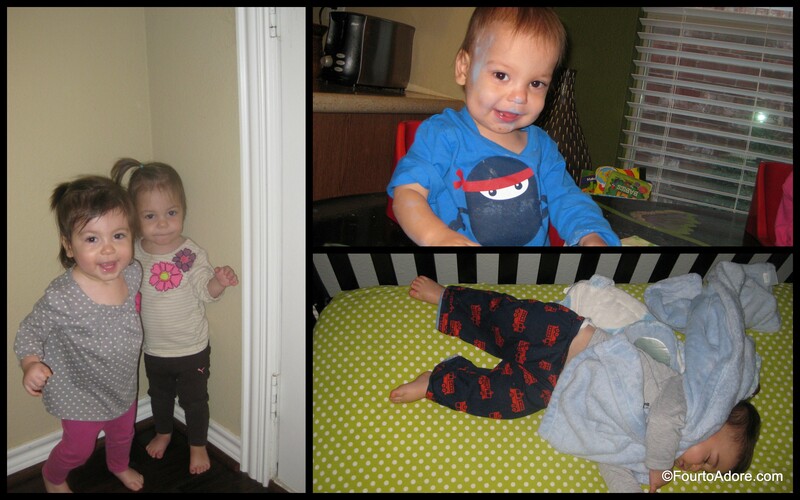 At 20 months old, the quads are getting into all sorts of mischief, so much that I can hardly keep up with them. Another conundrum is that they are quite aware of their behavior and I don’t want to encourage them to continue something undesirable (e.g. climbing on the couch and sprinting) by snapping photos. Nonetheless, I captured a few highlights hopefully without encouraging bad behavior. The quads have been doing exceptionally well with using utensils at meals. Don’t get me wrong; meals are still a total mess. 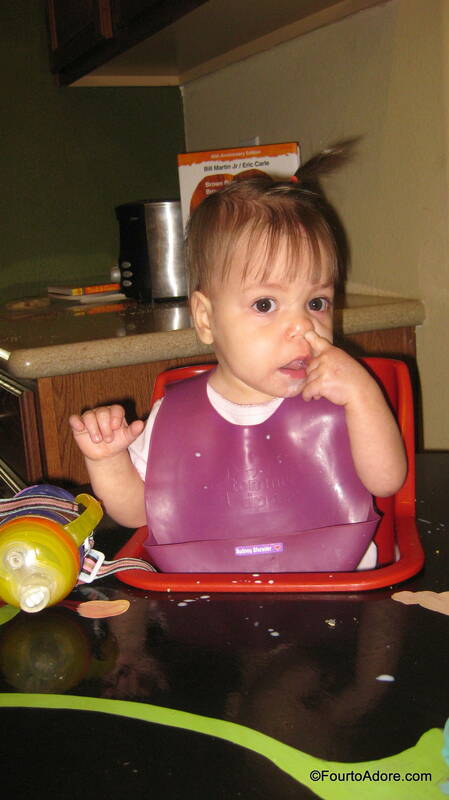 They are, however, getting food onto their utensils and they transferring that food into their mouth 50% of the time. I’m proud of their progress so I thought I’d do a post about how meals are going with a video clip of some of their marvelous self feeding skills. 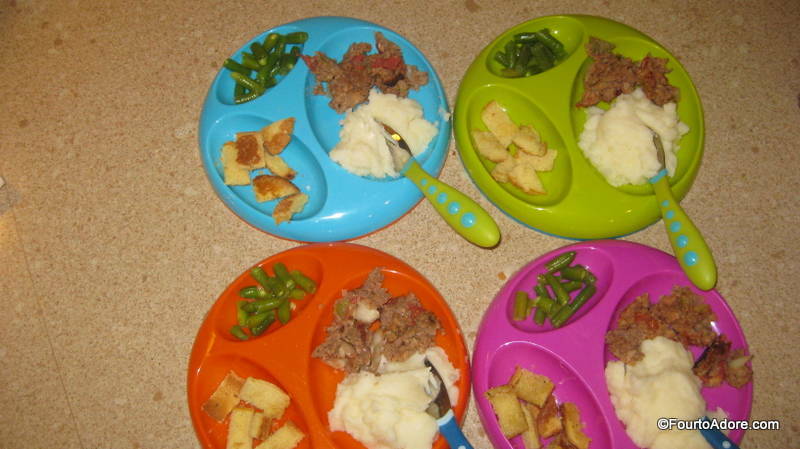 I prepared a meal that I thought would help them display their emerging skills: meatloaf with mashed potatoes, green beans, and garlic bread. I thought they’d effortlessly spear the green beans and meatloaf and could scoop the potatoes without them falling off the fork. W-R-O-N-G! The quads did not view this meal as a the culinary art of Suzy Homemaker. Instead, they saw a sensory experience to be seized. Mason grabbed potatoes by the handful and proceeded to fling them across the table as if it were a school cafeteria food fight. As I attempted to redirect him, Sydney artfully smeared potatoes in an arch shape across the table. It didn’t take long before Harper and Rylin joined the shenanigans. I was horrified it the disaster that was my kitchen. Not only were my children creating mayhem at the table, but they weren’t eating the meal I prepared with my last shred of energy for the day. UGH! The potatoes seemed to be wreaking havoc so I scooped them up and attempted to salvage the rest of the meal. I can’t win them all, can I? We’ve had many more meals that would be a fantastic example of civilized toddlers using utensils, but I’ve scrapped sharing that. It seems that when I hit “record”, things go awry. The meal started off as a pretty one. I tried. Mason looks a tad guilty here. In the evenings, George began a new tradition he may soon regret: piggy back rides. 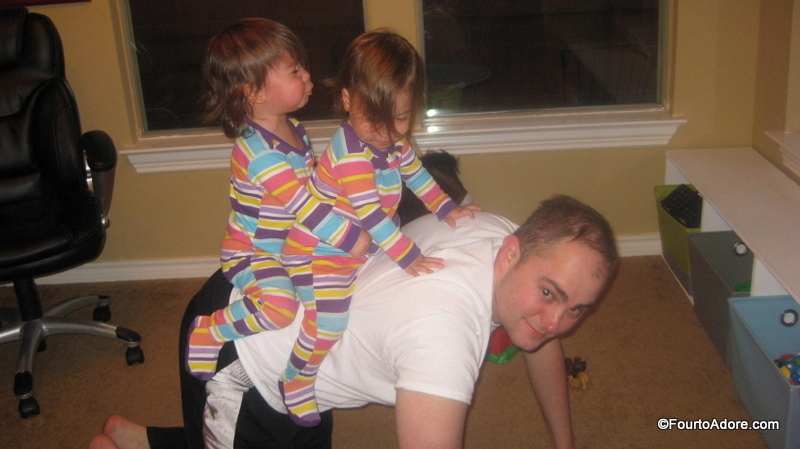 He lays on the floor, and one or two babies climbs on his back for a ride. They do surprisingly well checking their balance and hanging on. Of course, these piggy back rides are at a snail’s pace so if they fall it’s not a big deal. 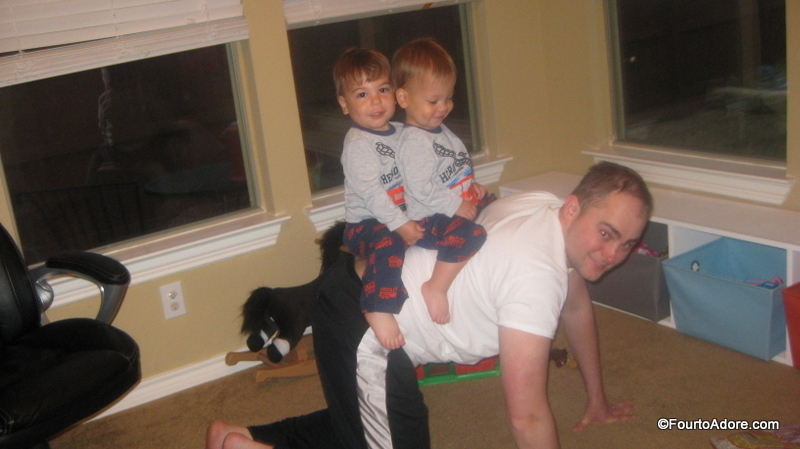 Sometime after nap and before dinner, the quads get all jazzed up with a second wind. They take great pleasure in darting up and down the hallways as they shriek creating a reverberating echo. I’m relatively certain this particular activity contributes to evening headaches, but they are happy squeals so I let them have their fun. What’s shaking at your house? 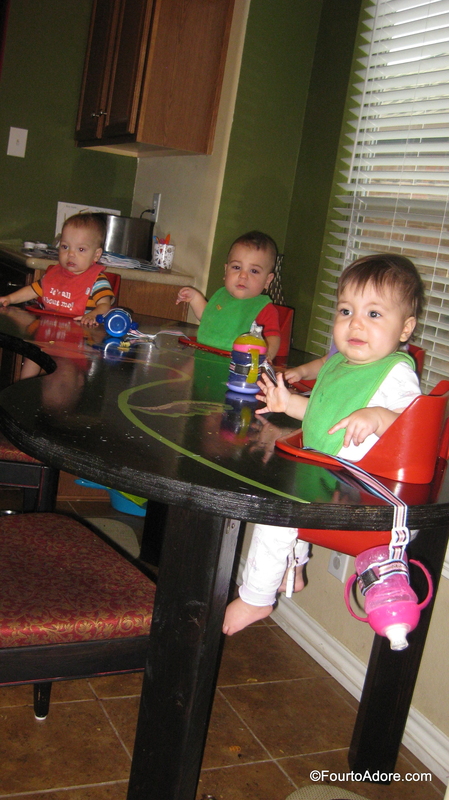 Most people are baffled when they realize I am a part time working mom of quadruplets. I have absolutely no doubt that if we had only one baby (or even one baby at a time) that I would be a full time working mother, and it would be perfectly fine. For seven years, I practiced school psychology in an urban school system. Yes, the job was often taxing and usually thankless, but it was part of my identity. I always hoped to be a model of female independence for my children by continuing to practice. Having quadruplets put a kink in the whole powerful, working mom gig. Even with a post graduate education, working in the public school system is not lucrative. At all. The cost of full time childcare would easily exceed my income, which forced us to consider the options. A few of my colleagues were able to work out part time positions so I approached my then boss about becoming part time as well. At the time, our district and my boss put the kibosh on part time employees because it’s a complex process. Yet, it was the only option for me. Either I transitioned to part time employment or I quit working to be a full time stay at home mom. When I announced our pregnancy news to my boss and proposed working part time, I recall his gobsmacked expression. He joked that I “pulled the quad card.” I guess I did. Perhaps if I was only expecting one baby my proposition would have been quickly and harshly denied. It took several months for my part time position to be approved by the district, but it was just before the quads were delivered. I am forever thankful for it. Breaks from work make the benefits of working part time glaringly obvious to me. I earnestly believe I am better as a wife/ mother AND as an employee from working part time. I get the best of both worlds. I have opportunities to raise my children and witness their growing up years, yet I also keep up with the professional world. Two days per week, I spend time having adult conversations, dressing in something besides yoga pants, and practicing the craft I spent years in school learning. I also see how I need to miss both home and work so I yearn to return to each of them. When I’ve been at home for days on end, I’m ready to tackle the office. While I am away, the quads benefit too. They are with fresh faces that teach them new things and present new experiences. They learn to obey and respect adults besides their parents as well as new skill such as imitating monkeys or naming colors. Likewise, at the end of a long workday, I can’t wait to see the four little people who will greet me shreiking “Mommy”, sticky fingers, and open mouthed grins. While being a PTSAHM was probably not something I would have done on my own accord, I am so happy I became a PTSAHM. Sometimes it feels as if our home is filled with bickering and screams, but there are also plenty of sweet, quiet moments to savor. Watching the babies explore things for the first time is atop my list of favorite times. 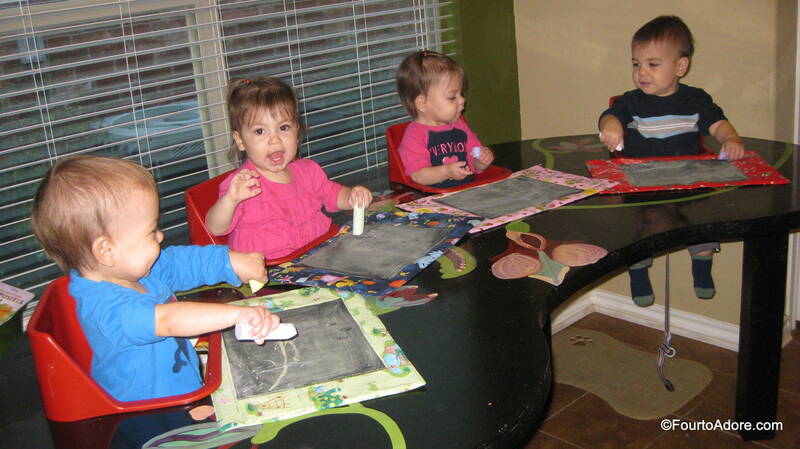 They received these chalkboard mats from Santa and LOVED them. Sisters hugging, a messy boy, and a sleeping boy all made my day, and reminded me why I love my days at home. I absolutely respect mothers who work full time as well as those who stay at home full time. No matter how you approach it, motherhood is an immensely challenging task. However, if you find yourself dissatisfied with your scene (full time working or full time home), you may want to consider the possibilities of part time employment, and you may be surprised at the outcome. About a month ago Dropcam contacted me about their “Life’s Mysteries” campaign. They invited bloggers to share stories of times when something went awry, but no one’s certain exactly what happened. With four toddlers in our house, missed moments occur several times per day. 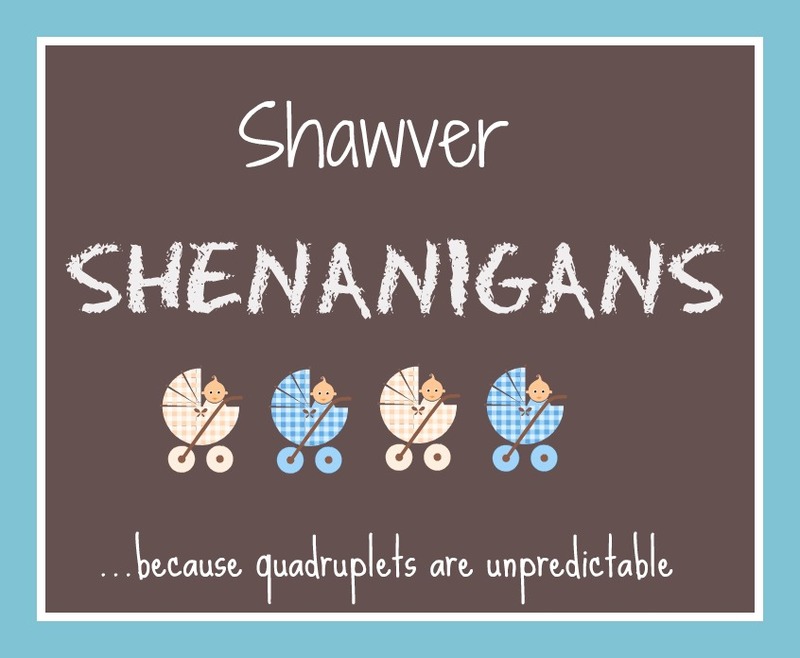 We have enough of them that I compile pictures for a semi regular series called “Shawver Shenanigans”. 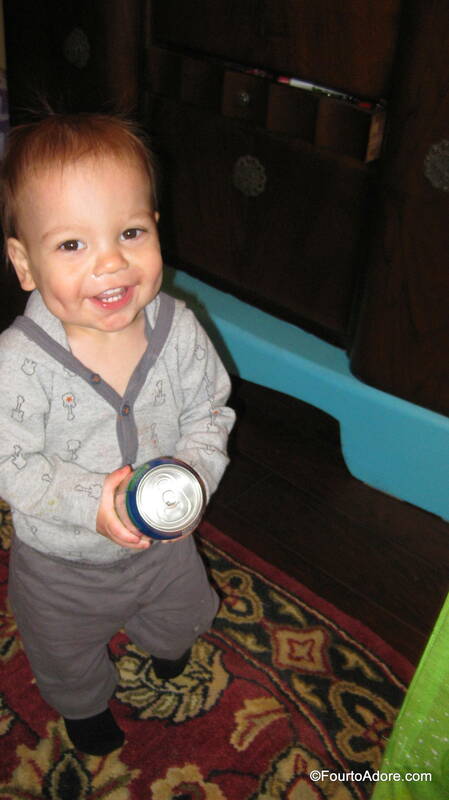 If you’ve been keeping up with us for a while, you may recall the great corn starch incident. It was a doozie! I think there are still traces of cornstarch in our kitchen, and that’s been months. Last week, we had a similar doozie during Icemagedon. In an effort to entertain four busy toddlers, I introduced many new activities, and opened up typically off-limits areas of the house since novelty is always entertaining. 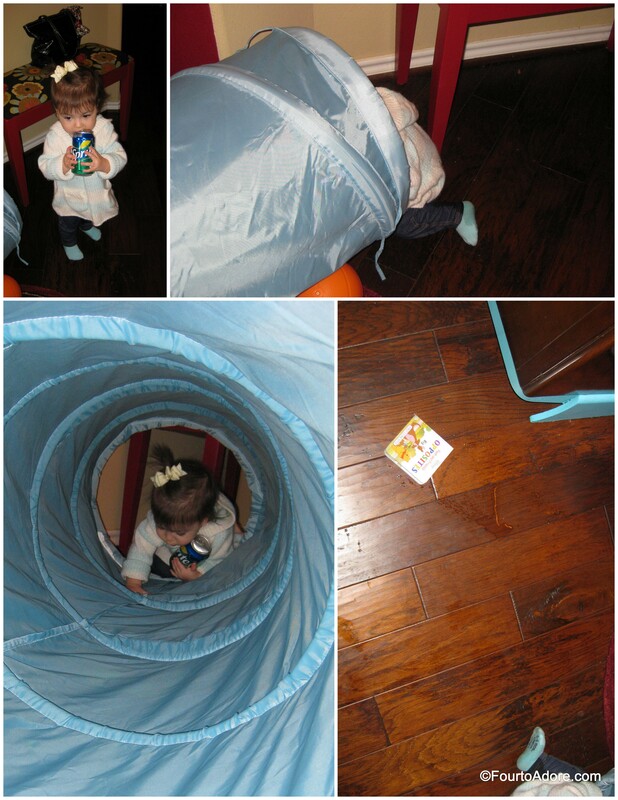 On this particular day, I set up our Tinkerbell PlayHut and a few tunnels in our dining room/ foyer. It was going fabulously until I left the room to change Rylin’s diaper, leaving three toddlers unsupervised. 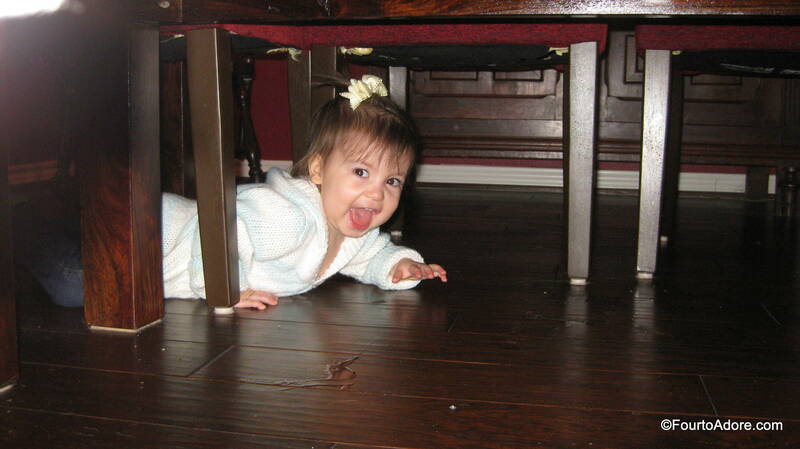 I thought I did a great job baby proofing this area. I was proven wrong. Upon my return, I realized the trio discovered a box of Sprite cans hidden underneath our hutch, and naturally began exploring them. Sydney had the empty box. 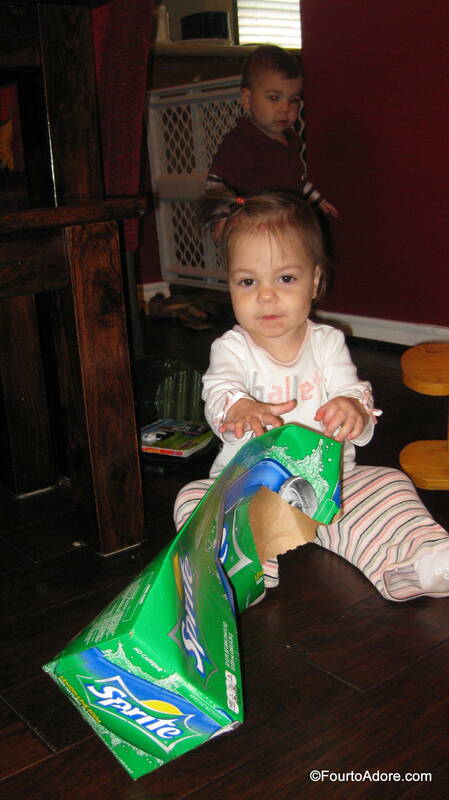 Harper gnawed on a can. Mason pranced around with his loot. Rylin did not wait for an invitation to play along. She gleefully snatched a can for herself. Judging by the pictures, it looks like she found a new best pal. 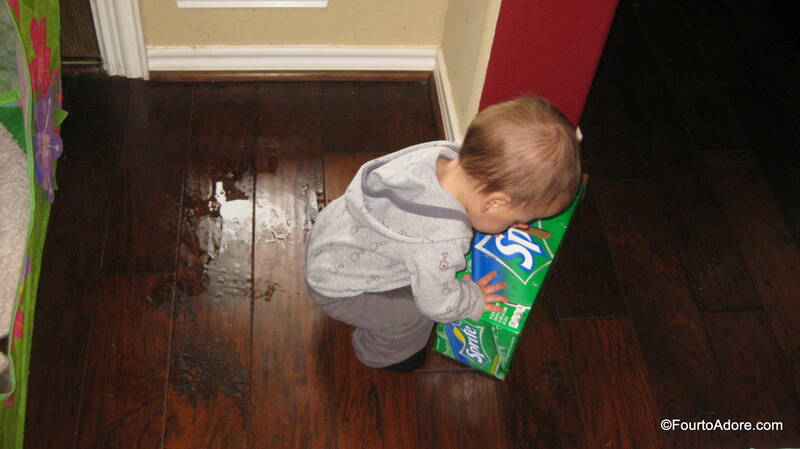 When my Dad called to chat, I figured Sprite cans were safe enough so I let everyone continue playing. That was, until I heard a distinctive sound- the one of a shaken carbonated beverage exploding. Apparently someone dropped, or threw their can. 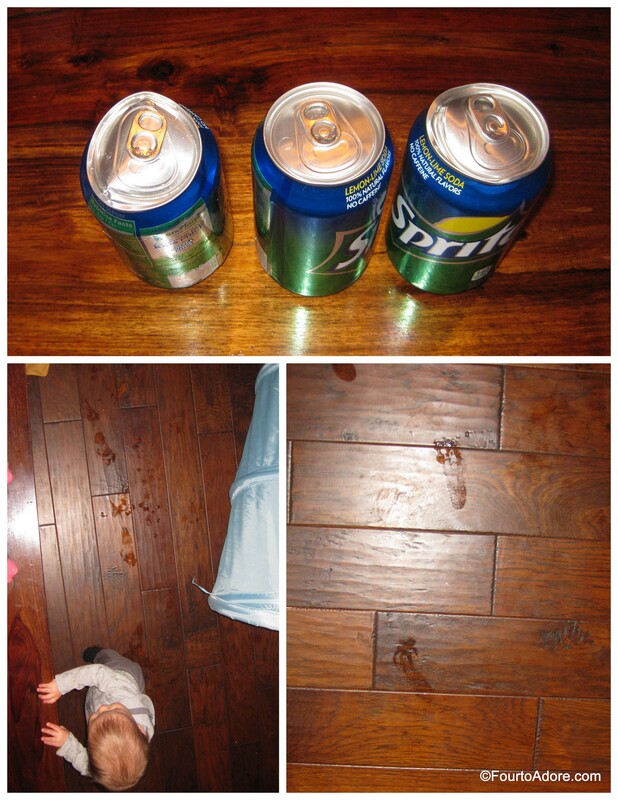 Naturally, this lead to a puncture on the can and an eruption of Sprite under our dining table. I ferociously grabbed the dented can, but it was too late. We already had a flood and eight little feet traipsing through it, tracking icky sticky all over the floor. Do you spy the wet foot prints trailing Mason? Rylin thought the splatter fest was great fun. 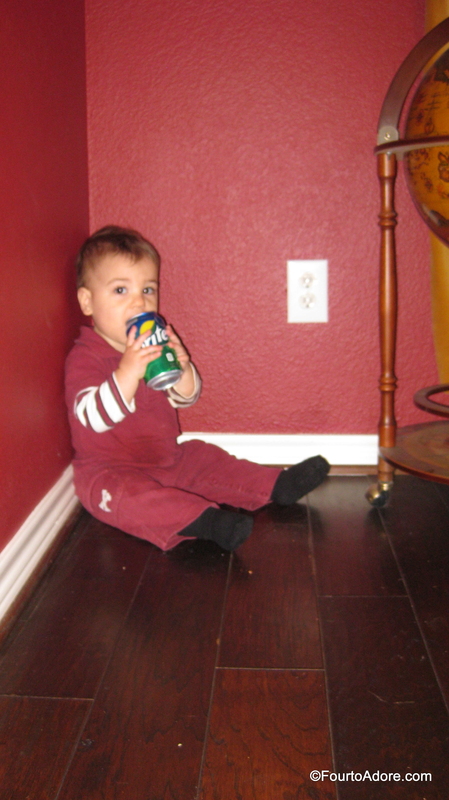 Mason was crushed when his Sprite can shenanigans came to a screeching halt. He seemingly caught the brunt of the spray and was soaked. I don’t believe we will explore soda cans for quite sometime, but I assure you that this is not the final Shawver Shenanigan. There are many, many more to come. In this episode of Shawver Shenanigans, we had not one but two incidents 1. exploration of forbidden Sprite cans 2. a Sprite explosion. Give the pictorial evidence, who do you suspect caused each of these incidents? P.S. I was in no way compensated by Dropcam for the writing of this post. I simply enjoy writing and a good challenge so I had fun in recanting our latest incident. I hope you enjoyed reading. 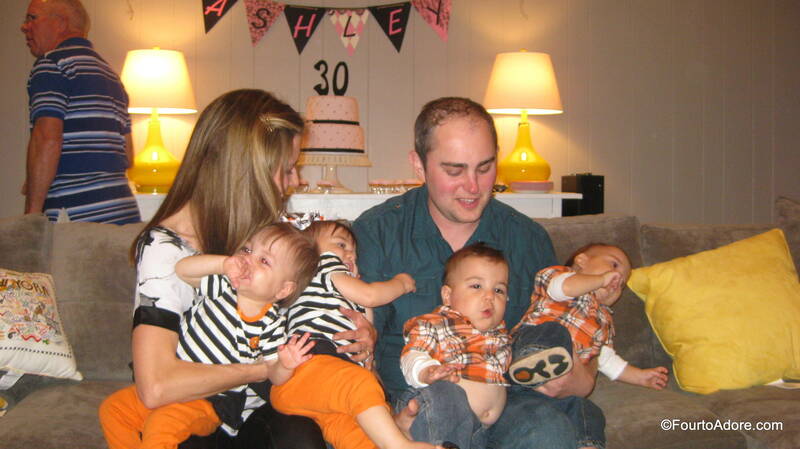 If a baby changes everything….four babies turn life upside down! Being Type A personalities, George and I attempt to run a tight ship, maintaining a predictable schedule and keeping everything in it’s place. I really like order. Yet, quadruplets have a way of forcing us to loosen the reigns and be far more flexible. We’re learning to roll with the punches more each day. We often just have sit back and enjoy the ride, taking it all in stride. If we took ourselves too seriously, we’d be in for a treacherous road. 3. This is the reason I rarely change the quad’s sheets…. Believe it or not, the summer wasn’t ALL about the babies. Yes, it was mostly baby centered, but as a Father’s Day gift I arranged stay-cation for George and I. To my delight, Nisey, Grandpa, Terri, and Ed accepted the challenge to babysit overnight. Seriously, to leave four babies overnight, we needed four adults. On Father’s Day, George received a gift certificate for a date night including dinner and movie of his choice. 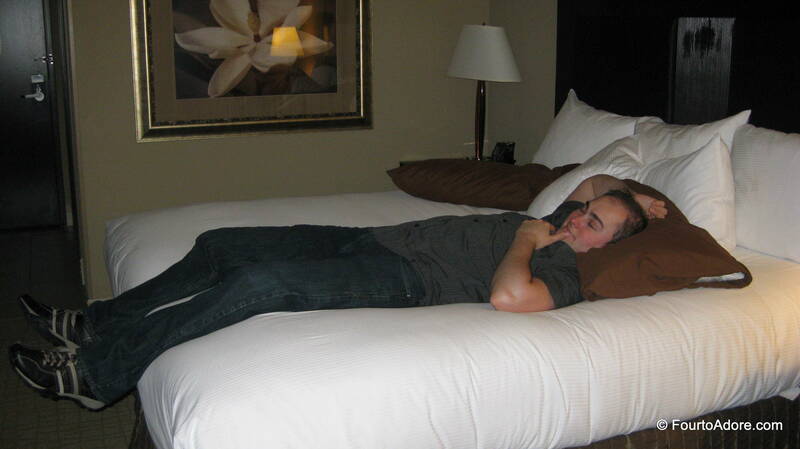 Unbeknownst to him, we were also staying the night at the nearest Hilton, our first night away from the babies. Since he had Cart Blanche, George chose the new Star Trek flick. I’ll be honest, I remember the television series, but have never seen it or any of the previous movies. Consequently, I had very low expectations for the movie. Fortunately, it was far better than I anticipated. Plus, I got the background on Star Trek, which means I now understand the references on the Big Bang Theory. 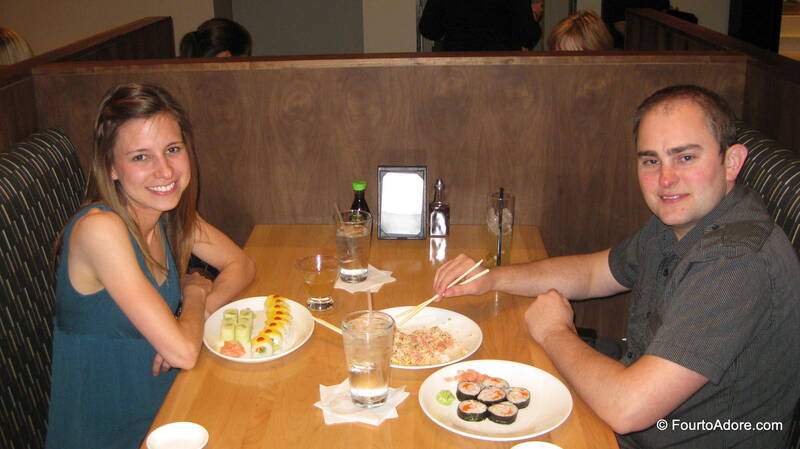 Following the movie, we enjoyed George’s favorite cuisine, sushi, at Sushi Zushi. I am not a fan of fish or really seafood in general, but Sushi Zushi, has a wide array of vegetarian/ vegan options I enjoy. We go out for date night and what do we do? 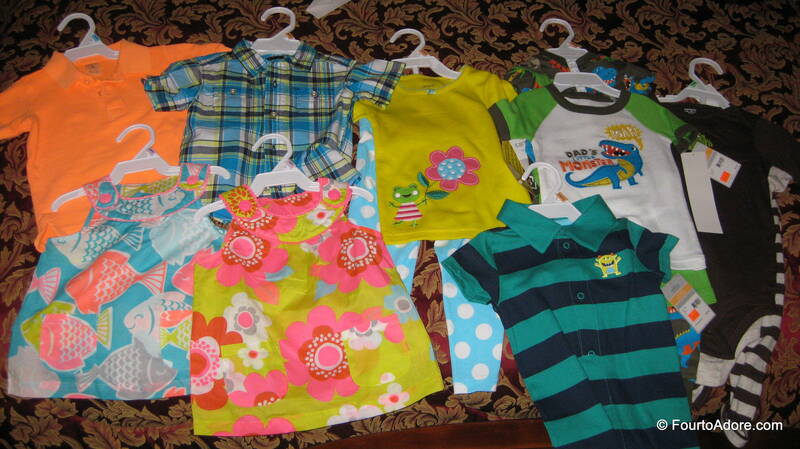 Go shopping for baby clothes of course! Even though I despise driving, I volunteered to drive home following our date. George became irritated with my indirect route home through a parking lot, and was puzzled when I parked the car outside the Hilton. At first, he was slightly disappointed when he realized we were staying he didn’t kiss the babies goodnight, but quickly warmed up to the idea. Even though the babies sleep well at night, sleep is a precious commodity always in short supply for us. I think we both conked out close to 10 pm. We had no chores to do or babies that needed tending, and we took full advantage of that. Naturally, we woke up at 7:15 am, right on cue. However, we did not get up to change, feed, or entertain anyone. Rather, we lazily enjoyed the morning before packing up to greet the babies back home. It may have been one night only, and near home, but our stay-cation was refreshing and much needed. Thank you, Nisey, Grandpa, Terri, and Ed for taking care of the babies overnight. Whoa, Nelly! Is it Thursday??? Sometimes I don’t know where the minutes and hours go. Before I know it, a week or more vanished right before my eyes. Since it IS Thursday, it’s time to link up with Rebecca at A Beautiful Ruckus to recall what little things brought happiness to our week. 1. Texas summers are typically stricken with heat waves and severe drought conditions. This year we’ve seen more pleasant showers than I can ever recall. 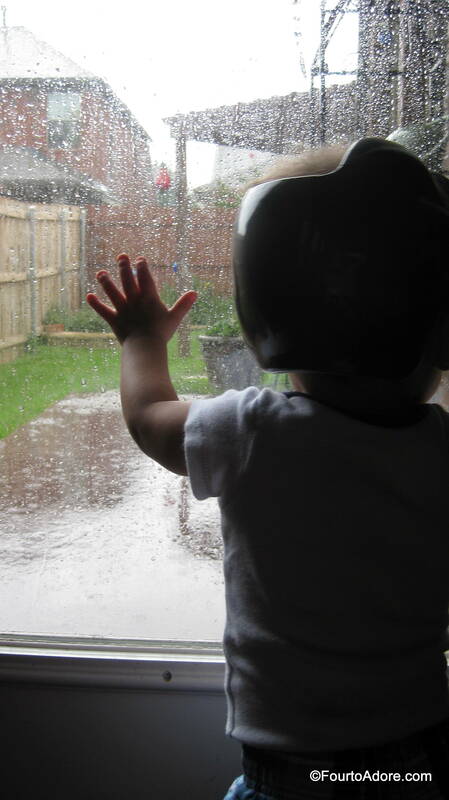 We still have plenty of triple digit days, but the rain is always refreshing. All four babies pressed their noses to the glass, but scattered before I could snap a picture. 2. Last night was our first bottle free night. In place of bottles we offered the babies Sippy cups of cow’s milk. Thankfully, they seemed content with this new bedtime routine and drifted off to a peaceful slumber without protest, and they stayed asleep all night long. 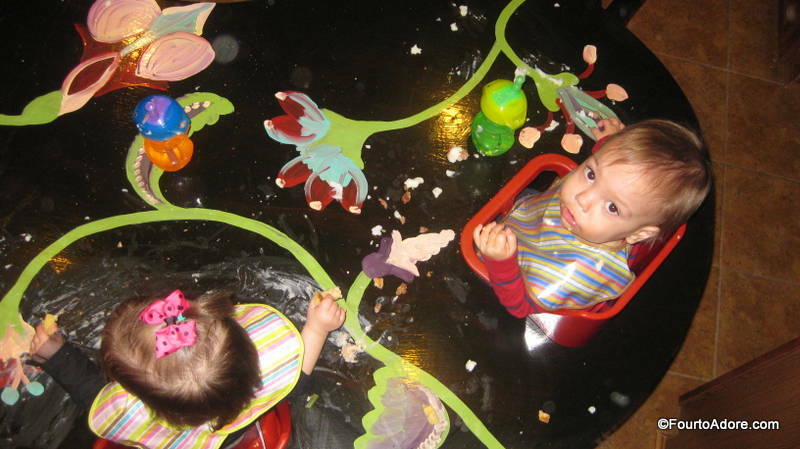 One new challenge with Sippy cups at the table, is the trill of playing with gravity. 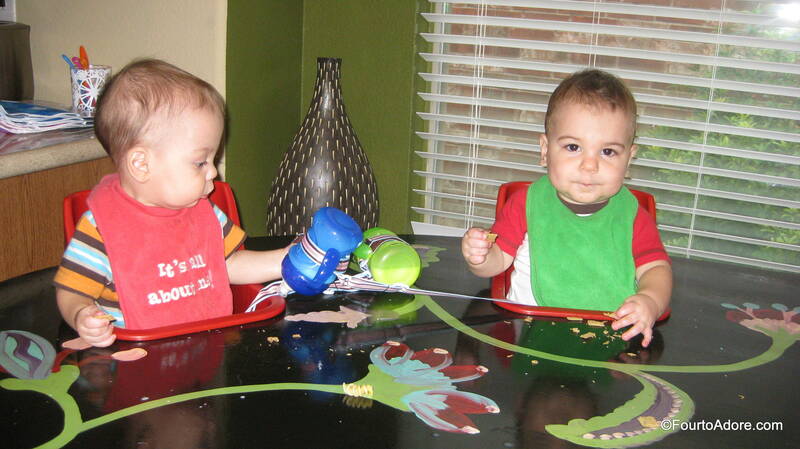 Without fail, the babies take a swig of milk then toss the cup over their shoulder. If the cup remains on the edge of the table, they push it until they hear that nice “crash” to the tile. I’ve been working really hard to redirect this behavior, but I sometimes miss opportunities. Yesterday I made my first ever trip to Buy Buy Baby and stumbled across Sippy cup straps. Ingenious. The babies still attempt to taunt gravity, but the cups don’t make it to the ground, which is hopefully not thrilling and cup tossing will soon cease. Rylin nudged her cup over the edge, but it dangled instead of smacking the tile. That’s no fun. Mason attempted to commandeer Harper’s blue cup, but it didn’t quite reach his lips. It looks like the Sippy cup straps solve another problem for me. 3. Periodically, I rotate the babies toys, keeping some in rotation while others are stashed away. 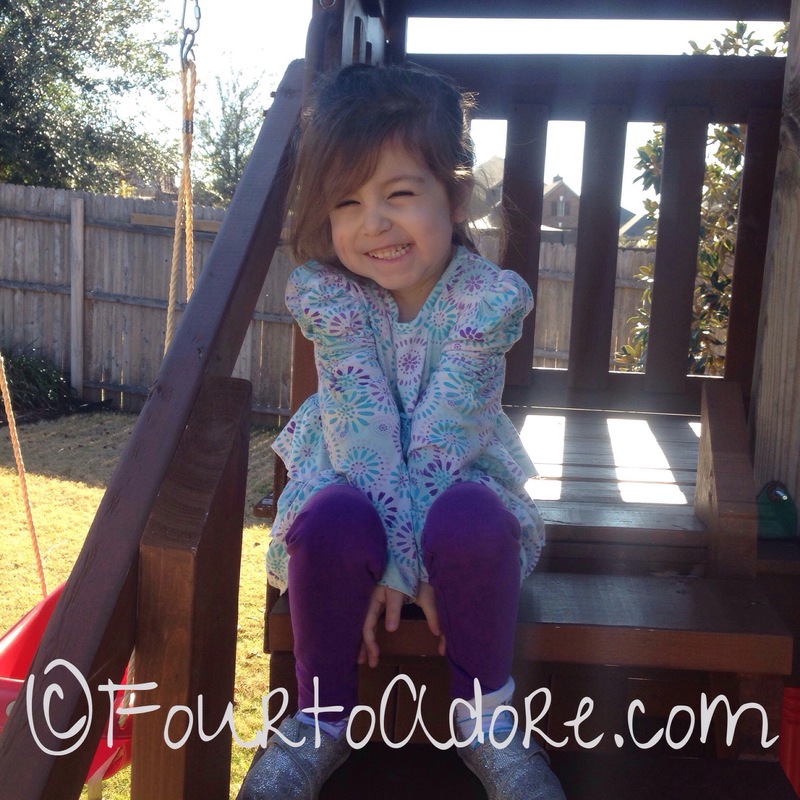 This week the Weeble’s tree house and camper returned from a sabbatical. 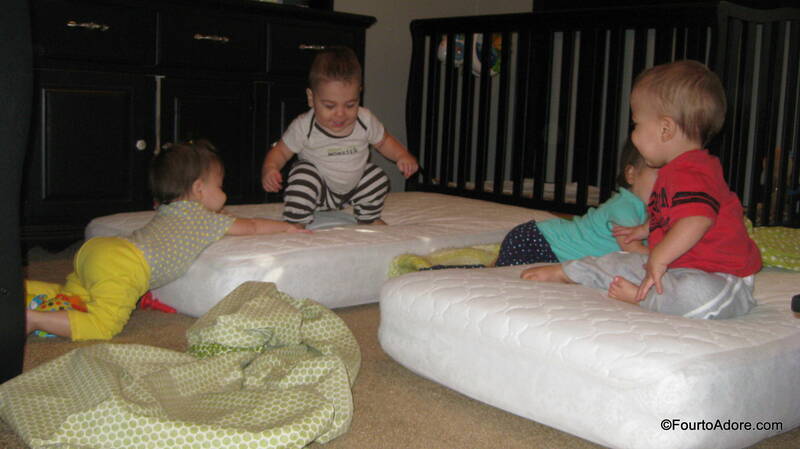 The babies were thrilled to reacquaint with their old friends. 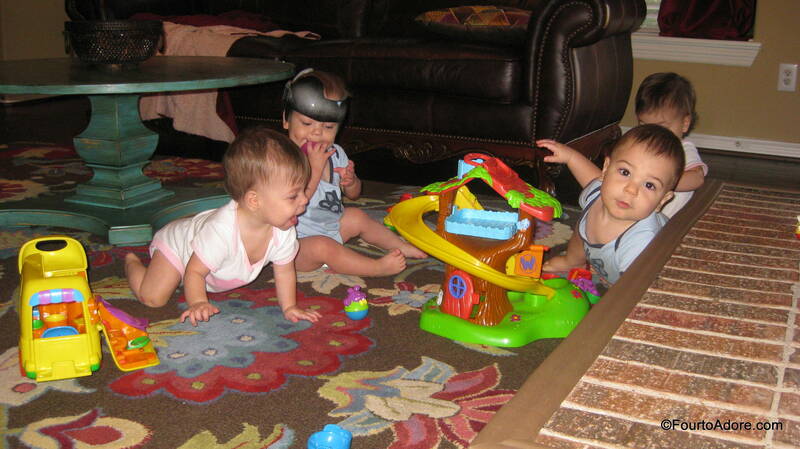 The best part was the babies now discover how to play with the toys. These Weebles have been sent down the slide and for a camper ride numerous times this week. Weebles wobble, but the don’t fall down! What simple pleasures did you enjoy this week?